Stated 1st edition. Very Good HC in Good- DJ. Green cloth over boards, silver titles. Bright, clean, square covers and spine; slight fading at spine ends; tightly bound; bright, crisp, clean interior. DJ is scuffed; chips at spine ends; 1 inch chip missing at front cover top fore corner; small chips and tears along edges. 8vo, 212 pp. Oct 1906; 1st printing. Good HC, no DJ. White cloth over boards with blind stamped rules around central color paper plate, gilt letters; top edge gilt; untrimmed fore and tail edges; tissue guarded color plates; 2 color title page. 80 leaves, printed & paged recto only. Lightly scuffed/soiled covers; spine lettering partially effaced; tightly bound; library matter on front pastedown; ghost on rear pastedown; stamps on rear free end paper; clean interior; foxing on illustrations tissue gueards, otherwise clean interior. Large 12mo. Black cloth over boards, red letters. Clean, lightly suffed covers and spine; spotty fading on covers; tightly bound; age darkening on end papers; owner name in pencil on front free end paper; clean interior. DJ is missing 1/2 of front cover; remainder is lightly scuffed/soiled with small chips along edges. 8vo, 261 pp. 'New edition.' Brown-dark olive ungrained cloth over boards, gilt letters; light gray end papers. Clean covers; lightly scuffed; bumped at lower fore corners; rubbed with splits at spine ends; 1/8 inch strip of cloth missing at spine tail; tightly bound (reglued at hinges); partial bookplate on front pastedown; owner signed name 'Christopher Lasch' (noted author and historian, Univ Iowa, Northwestern Univ & Univ Rochester) on front free end paper; clean interior. 12mo, 505 pp. 1st printing (April 1914). Good+ Hardcover, no DJ. Gray paper over boards backed with black cloth, dark gray letters & design on front cover; no spine lettering; untrimmed fore & bottom edges. Lightly scuffed/soiled covers; rubbed at spine ends, no splits or fraying; owner bookplate on front end paper; tight; clean interior. 12mo, 48 pp. 9th printing. Good HC, no DJ. Blue cloth over boards, gilt letters enclosed in gilt frame & blind stamped frame; laid paper; decorated initial caps. Lightly scuffed covers; sunned on spine and slightly along cover edges; splits at spine ends; small chip in cloth on edge near front top fore corner; tightly bound; clean interior. From Ambassador Ellsworth Bunker estate; signed in pencil 'Ellsworth Bunker | 1922' on front free end paper. 12mo, 288 pp. PB 16mo VG/-- 1st Ed. 317 pages. 1st ed/1st printing. Very little handling wear to wraps; tight, clean; owner's name and date on inside front wrap; age darkening to inside wraps; some age darkening at page edges. Good HC, no DJ. Red cloth over boards; once gilt stamped titles on spine; untrimmed textblock fore edges. Clean, square covers and spine; spine gilt chipped off, darkened titles remain; tightly bound; several interior pp have slight staining, otherwise light, clean interior. 12mo, 356 pp. Unstated edition/printing. 'Unexpurgated authorized edition.' In English. Good- softcover. Scuffed/soiled covers; some age darkening; 1 inch splits at spine end/cover joints; tightly bound; clean interior; rough edges at text block fore edge from incautious leaf opening. 12mo, 381 pp. Very Good HC. Full, dark blue leather, stamped gilt letters and design; ribbon marker; top edge gilt; blue and copper false marbled end papers. Light rubbing to top corners; 1/16" missing from head of spine; inscription and date (1925) on frontispiece obverse; bright, clean interior. 16mo, 532 pp. Green, diagonal bead-grain cloth over boards blind stamped on covers with Greek key frame; gilt stamped title on spine. Clean covers and spine; rubbed at spine ends with some fraying; light rubbing at fore corners; tightly bound; top quarter of title page torn off; clean interior. 12mo, 464 pp. 1st printing. Good HC, no DJ. Green paper over boards backed with off white cloth; front cover enclosed in double black rules with fleurons in corners; black letters. Clean front cover; spine age darkened; 1 inch stain on back cover near spine; rubbed at spine ends, small splits & light fraying; rubbed at fore corners, boards just exposed; tightly bound; 3 leaves (11/12 thru 15/16) have 1 inch closed tears at top fore corners; clean interior. BAL 10701. 12mo, 153 pp. Stated 1st printing. Very Good HC in Good DJ. Gray cloth over boards, blue letters, blue and white rules. Bright, clean covers and spine; tightly bound; crisp, clean interior. DJ is lightly scuffed; rubbed at front top fore corner; slightly age darkened on spine; back cover has small area of paper lift near bottom edge from price label removal. 8vo, 287 pp. Stated 1st American ed. Good HC, no DJ. Orange cloth boards with black letters. 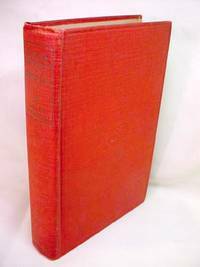 Lightly scuffed covers; some sunning on spine and slightly at cover edges; uneven fading on covers, somewhat mottled; tightly bound; some age darkening on end papers; clean interior. 8vo, 273 pp. Bright, clean covers and spine; very slight age darkening along front cover egde; tightly bound; clean interior; slight age darkening along text page edges. Large 16mo, 428 pp. Good+ HC in Good DJ. Red cloth over boards, black panels with gilt letters. Slight sunning on spine; few light scuffs to rear cover; owner name on front free end paper; partial split to super at title page; still tightly bound; clean interior. DJ is scuffed; chipping and small tears along edges. 8vo, 1223 pp. June 1903; 1st printing (publisher's device on copyright page). Very Good HC, no DJ. Ex-library. Orange vertical rib-grain (Blanck's 'T' cloth) cloth over boards with blind stamped floral motif on front cover and spine; gilt titles. Bright, clean covers and spine; tightly bound; bookplate on front pastedown; pocket on rear pastedown; appears uncirculated; bright, clean interior. 12mo, 359 pp + 2 pp adverts; bibliography of author's works. BAL #18945. 1st Am edition. Good HC, no DJ. Brown patterned pseudo-marble paper over boards backed with dark blue cloth, gilt letters. Clean, scuffed covers and spine; .5 x .75 paper lift on front cover where cloth meets paper; small scraped paper lifts on back cover; rubbed at spine ends with small splits at tail; rubbed through paper at cover edges and fore corners; bookplate ghost on front free end paper; small label ghosts on pastedowns; small area of damp stain at text block top fore corner affects approx 50 pp, text not affected; tightly bound; clean interior. 16mo, 364pp + 4 pp adverts. 1st printing. Fine HC in Good+ DJ. Blue cloth over boards, gilt letters. Bright, clean covers and spine; tightly bound; crisp, clean interior. DJ is clean and complete; lightly scuffed; 1/2 inch closed tear at front cover top edge; 3/4 inch closed tear at back cover top edge. 8vo, 135 pp. Author's first novel. 1st printing. Good+ HC, no DJ. Blue paper over boards backed with red cloth, silver and gilt titles. Clean, square, lightly scuffed covers; faded on spine (titles faded but legible) and slightly along cover edges; very faintly damp stained along cover tail edges; tightly bound; slightly age darkened on end papers; light, clean interior. 8vo, 185 pp.